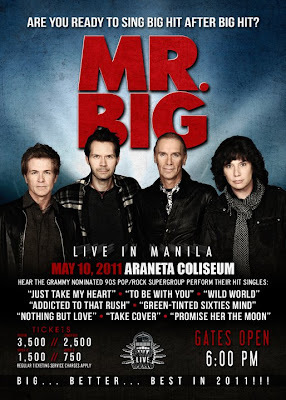 For my first ever music post, I would like to talk about the concert I'm really looking forward to this May 2011, it's Mr. Big Live in Manila! Oh yeah! And I thought I'd never see the classic lineup perform live. Anyway, ever since I was a kid, I've always liked Mr. Big. I remember back in high school, I bought cassette tapes of their albums (click the album pictures below to listen to their songs) "Lean into It"
If you haven't heard of them before, they're the band behind hits like "To be with you" and "Wild World". Their guitar player, Paul Gilbert, is one of my idols and inspired me in a lot of ways. My favorite Mr Big song is "Green Tinted Sixties Mind". The guitar parts on that song are really awesome! I remember trying to play the intro sequence back then and getting really frustrated coz I just can't nail it. Well things have changed now my friend and I'll never stop practicing the guitar 'til I have the chops of Paul Gilbert. I'll talk in detail about Mr. Gilbert in my next music post.